Find hotel near St. Bernard De Clairvaux .. The Ancient Spanish Monastery and the Church of St. Bernard de Clairvaux was originally built in Sacramenia in Segovia, Spain, in the 12th century. It was dismantled and moved to the United States and reassembled in its final location in Miami in the early 20th Century by millionaire William Randolph Hearst. The medieval architecture of the structure has been retained and the building is one of the oldest in the western hemisphere. 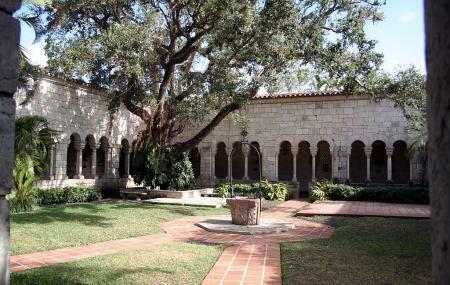 The cloister has a permanent exhibit that tells the story of this historic landmark. The grounds and church are a popular wedding venue. However the interesting history is a major attraction for tourists and architecture enthusiasts. It is also a place of worship and holds regular mass. The venue can be booked for filming and private events. Closed for private events, call before visiting to check schedule. Mass is held on Sundays at 8:00 am and 10:15 am in English and at 12:15 pm in Spanish. Last admission is at 4:00 pm. How popular is St. Bernard De Clairvaux Church? People normally club together Fort Lauderdale Historical Society and Bourbon Steak while planning their visit to St. Bernard De Clairvaux Church. Such a beautiful place full of history. Well worth the visit (and multiple visits at that!). Sacred space that lifts the spirit. The ambiance here is subtle and profound. I loved it. I've never been to the monastery and I have lived here for a long time. It's a beautiful playtime visit and it's not expensive. Beautiful place full of history, absolutely a must visit!